Home History General What’s Richardson Got to Do with Pike? As we finish up two years worth of newsletters covering Zebulon Pike and other explorers, there’s an appropriate segue that we’d be remiss to pass up. The New Year, 2006, is rapidly approaching and will mark the sesquicentennial anniversary of the formation of Morrison County. Nathan Richardson, the “Father of Morrison County,” was one of a handful of men who were instrumental in the founding of the county. Richardson was named the first Register of Deeds and Clerk of the Board of Commissioners. When the county was formed in 1856, the half lying east of the Mississippi River was carved out of Benton County. Morrison County west of the river did not exist until 1867, when Nathan Richardson won a seat in the House of Representatives of the State Legislature. Nathan decided that a portion of Todd County should be added to Morrison County. This “pet scheme” of his had been ten years in the making because Todd County residents were understandably unwilling to give up a portion of their county. It wasn’t until most of the men in Todd County left to fight in the Civil War that Richardson made some headway with his plan. When he was successful in gaining a contested seat in the legislature in 1867, he sponsored a bill to change the boundary between the two counties. The bill passed and Morrison County doubled in size. Nathan went on to serve two more nonconsecutive terms in the State Legislature, where he learned to author bills and get monetary support for local and regional projects. He used this experience to assist a later legislator, “Friend Young,” in drafting a bill to fund the construction of a monument to mark the site of Lt. Zebulon Pike’s fort. It is unclear whether this legislation, which asked for an appropriation of $1,000 for the monument, was ever submitted by Young. What is clear is that Richardson thought the site important enough to mark. This was not the extent of Richardson’s interest in Pike’s fort, but the culmination of a long-time relationship with the site. “Uncle Nate” was the county’s original historian, writing its first history in 1876 and updating it in 1880. Pike’s expedition is mentioned in the appendix to Richardson’s 1876 history. By 1878, Richardson and Professor Winchell, from the Minnesota Historical Society, searched the east side of the river for Pike’s fort. They were unsuccessful in locating the site, but Richardson didn’t give up. The following year, upon receiving a tip from Benjamin Bolt, who lived at the mouth of the Swan River, he found it on the west side. Richardson noted that there was a large pile of rock at the northwest corner of the stockade, which he theorized must have served as the chimney. In 1894, he took Pike historian Elliott Coues to the site. When Coues saw the fireplace stones, he suggested to Richardson that a monument to Pike be built of them at the site. He encouraged Nathan to personally oversee the project. As the draft legislation is undated, it cannot be ascertained whether it was written before or after Coues’ request. One thing is certain, though. Richardson wasn’t around when the monument was eventually dedicated. He died in 1908. Somehow, momentum for erecting a Pike monument didn’t wane in the following eleven years. 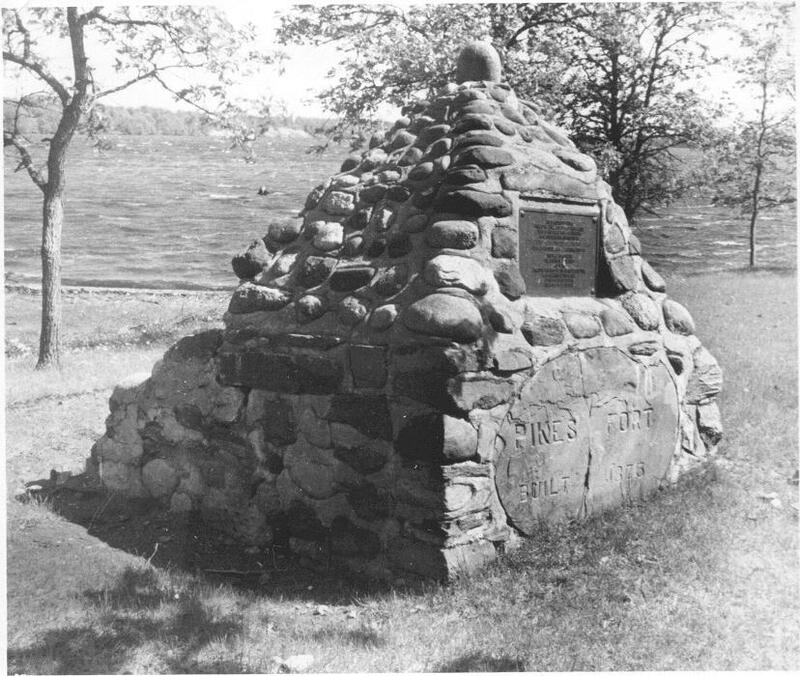 Under the auspices of the Minnesota Daughters of the American Revolution and the citizens of Little Falls, the monument, made of the fireplace stones, was dedicated on September 27, 1919. While Nathan Richardson was not part of the dedication, without his perseverance in collecting area history, scouting out the fort site, or work toward erecting a monument, the Pike expedition may well have become as intangible as dust in the wind, for in 1924, upon the completion of Blanchard Dam, the fort itself was submerged under the waters of the Mississippi. The monument Richardson devoted his energy to remains a solid landmark of Zebulon Pike’s accomplishments. Zebulon Pike's monument, built of stones taken from the fireplace of Pike's Fort south of Little Falls. The monument sits on private property. Photo from the collections of the Morrison County Historical Society.